I do, however, think January is the perfect time to pay some attention to our skin and hair – and there are plenty of products out there to make a serious beauty detox feel like a bit of a treat! At bedtime, I will be swapping my usual bubble bath for generous glugs of Tisserand Detox Bath Oil, £7.60. The blend of Organic Juniper, Lemon and Black Pepper helps to stimulate sluggish circulation and encourage the elimination of toxins. Better still, it feels hugely relaxing and leaves skin feeling silky soft. Whilst in the bath, I will exfoliate skin with handfuls of Crabtree & Evelyn Aromatherapy Distillations Purifying Clarifying Body Scrub, £22.56. It wakes up skin with lashings of Sea Salt and wakes up the senses with the zingy scent of Eucalyptus and Lime essential oils. Fudge Daily Mint Shampoo, £7.61, andFudge Daily Mint Conditioner, £7.61, make the perfect daily detox revival for hair and scalp. The shampoo lathers easily and both products smell incredible (perfect for early mornings when you need a bit of a kick!) The magic ingredient is Guarana, which repairs, protects, hydrates, and restores strength in hair. To rid my complexion of toxins (much needed after the last few weeks), I will be using Caudalie’s brilliant Vinopure Purifying Mask, £18.38, three times a week. It contains Kaolin and Bentonite Clays, which draw impurities out from the skin. It also contains skin-calming ingredient Camomile, and antioxidant Grape Seed Oil – so skin is soothed, nourished, and protected. If you use fake tan – and my skin has seen enough of the stuff over the festive season – it’s a good idea to detox the body before reapplying in the new year. 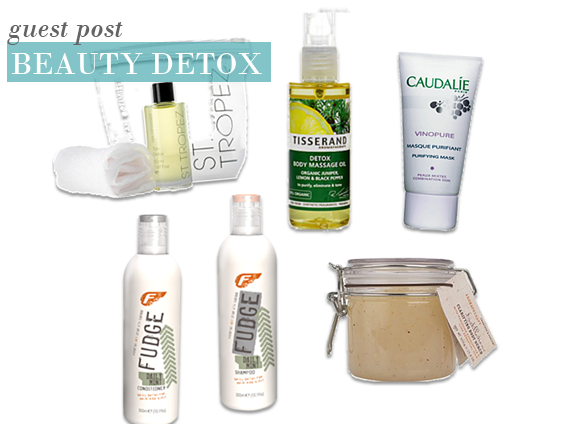 St Tropez Tan Detox, £24, is the perfect tool for the job. It removes unwanted self-tan build up and leaves skin ultra soft, smooth, and returns skin to its natural colour. I’ve never enjoyed detoxing quite so much! This entry was posted on Monday, January 17th, 2011 at 9:00 am and is filed under Bath & Shower, Guest bloggers, Skincare. You can follow any responses to this entry through the RSS 2.0 feed. You can skip to the end and leave a response. Pinging is currently not allowed.